The first-born son of his generation, Peter Balakian grew up in a close, extended family, sheltered by 1950s and '60s New Jersey suburbia and immersed in an all-American boyhood defined by rock 'n' roll, adolescent pranks, and a passion for the New York Yankees that he shared with his beloved grandmother. 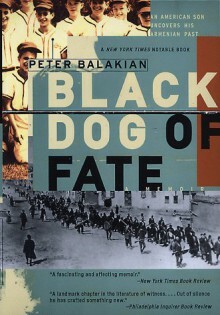 But beneath this sunny world lay the dark specter of the trauma his family and ancestors had experienced--the Turkish government's extermination of more than a million Armenians in 1915, including many of Balakian's relatives, in the century's first genocide.In elegant, moving prose, Black Dog of Fate charts Balakian's growth and personal awakening to the facts of his family's history and the horrifying aftermath of the Turkish government's continued campaign to cover up one of the worst crimes ever committed against humanity. In unearthing the secrets of a family's past and how they affect its present, Black Dog of Fate gives fresh meaning to the story of what it means to be an American. It's been a long time, but I remember being absolutely floored by this book.